For years, I proudly displayed that modest trophy in the various places I’ve called home. It represented one of the few possessions I kept a close eye on during any moves I made. It sat proudly on my desk at 187 Abbott Parkway in Blasdell. It stood tall atop my antique red bookcase on 19 Dortmund Circle in Chili. It resurfaced on my desk again on 8 Dixon Woods in Mendon and on Oliver Street during my requisite years’ penance living in the City of Rochester. So treasured is this shiny piece of plastic and brass, I guarded it carefully during the 4 weeks of homelessness (i.e., living in the basement of the friends of my parents) until my own homestead was finished in Mendon. I placed the trophy in a copy paper box and stored it firmly with a few other choice items of my youth, fully intending to display it once more in my new home. But the move got complicated. My brother and I had to rent an empty office in downtown Rochester to store our possessions during our month of basement living. The melodrama being played out between me and the homebuilder didn’t help things. The fact I actually had to hire someone to move our belongings (how could I prevent them from breaking things?) only added to the anxiety. On top of all this, my brother’s wedding was scheduled the day after the closing date of the house. During this windstorm of activity, everything ultimately made it to the new digs (I think). Between my job and interior design work, (and getting an MBA and starting a business and getting married…) it was only natural for some of my material to stay packed away for years. At a minimum, I remembered to stow the trophy in a secure manner and place. When I finally finished building the stained wood shelving in my den a few years into marriage, I was ready to display the trophy anew. But, where did I put it? I remember loading it into a box with other handmade trivia (mostly the fruit of mandatory industrial arts classes taken in middle school). I couldn’t remember just where I decided to store that particular box. I scoured the house. Nothing. I rifled through dresser drawers and desk drawers. Nothing. I even went through the two bedroom closets (now my daughters) I knew I used specifically for this type of storage. Nothing. And so the trophy became a favorite family story, my own personal Rosebud. I never gave up looking for it, and Betsy and the kids liked to rib me about it. In fact, it got to the point where they began to question whether it really existed and whether I had even really won the thing in the first place. Enthusiasm for this story waned, however, after Peter and I joined the adult-youth bowling league at Brongo Bowl in Honeoye Falls. 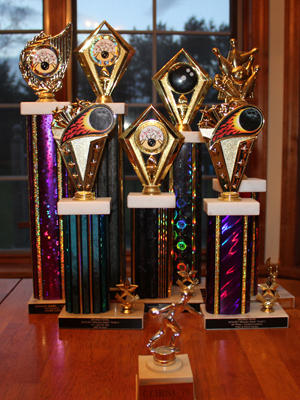 Soon, and rather unexpectedly, we found ourselves up to our eyeballs in bowling trophies. Even Betsy and Catarina managed to score a first place monster during their one and only year of participation. Today, our living room corner table acts as a base for a cavalcade of bowling trophies, crowding out the memory of the one earned on that day of the solar eclipse. It’s been more than twenty-five years since I moved into this house. No doubt only my children will see some of that stuff I packed away when Ronald Reagan led the nation. Of course, with a house this old, sometimes things start failing. The most likely source of such failure lies within the plumbing network. And so it happened one day in March, the master bathroom starting to drip through the dining room ceiling below. Now, if you don’t know, anything involving the master bathroom is bound to be complicated, and that includes the plumbing. (I was never confident in the plumbing of the house. That’s one of the dramatic story arcs involving the builder.) Being complex, the only solution required us to cut through drywall, including a portion of the wall of my son’s closet (actually, the storage facility of my and my brother’s sports memorabilia collection – yes, my son doesn’t have a closet he can call his own). Naturally, before we could play handyman, we had to relocate much of that memorabilia. So my son and myself, later accompanied by my brother and his younger son, began pealing back the layers of a sports card business dating back to our high school days. When we reached the bottom, beneath thousands of opened, unopened, sorted and mounted baseball and football cards, we found a trove of unrelated items, probably dating back to the original move. 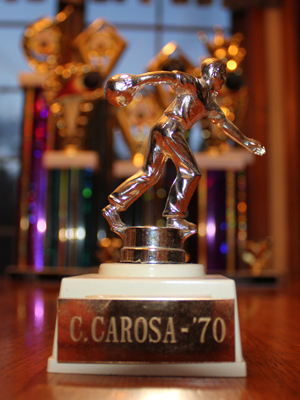 My old bowling trophy! The prodigal son had returned. Its two-and-a-half decades of eclipse ended. I could not contain the excitement. No doubt with the same fervor displayed when I originally won it, I danced with it throughout the house for all to see. I called everyone in my family to share the good news. Heck, I probably even Tweeted it.